never cook lamb before. always had the impression that it was terribly hard! unlike a beef steak which you can just throw in the pan, lamb is like “who can cook lamb?” – unknown, undoable..
in fact, when eating out, I hardly ever order beef, since I can make a rather good steak myself with no effort & at fraction of the cost (just like I will only order squid-ink pasta since it is about the only pasta I don’t make myself); so its lamb or fish everytime (dining out) except at some famous grills, Japanese or fine dining restaurants.. I have a friend though always posting lamb pictures & obsessed with meat thermometers (which I now have 2 thanks to this friend for one, and still have not used any!) Well, I only started cooking much since March2012, so thermometers will have a future with me, I think..
so I gotten myself this packet of lamb, which contained 2 frenched lamb racks, and on the first occasion when enough guinea pigs volunteered to dine at my place, I gave it a go and cooked my first ever lamb rack. 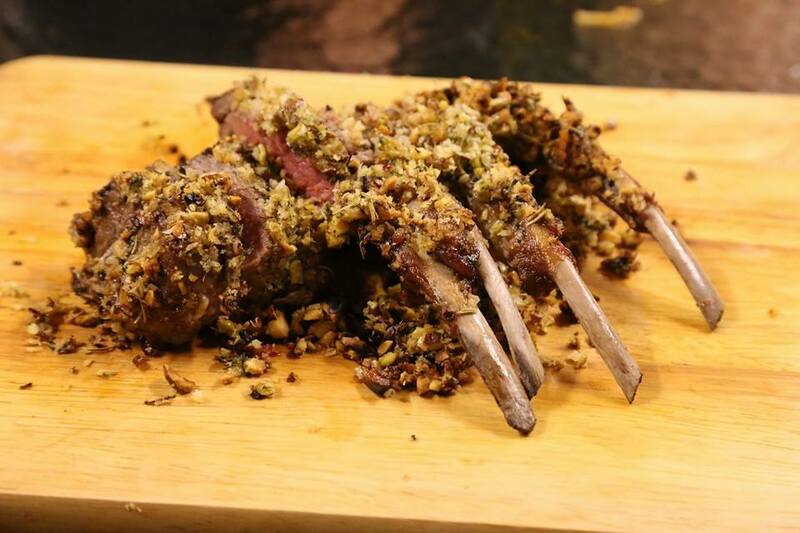 I always like Foodwishes.com Chef John’s cooking videos, and this pistachio crusted rack of lamb recipe is no exception. It is really very easy to make, much easier than the 2-hr slow-cooked Spanish beef ribs which requires preparations & cooking for the vegetable ratatouille for sauce & garnishing. 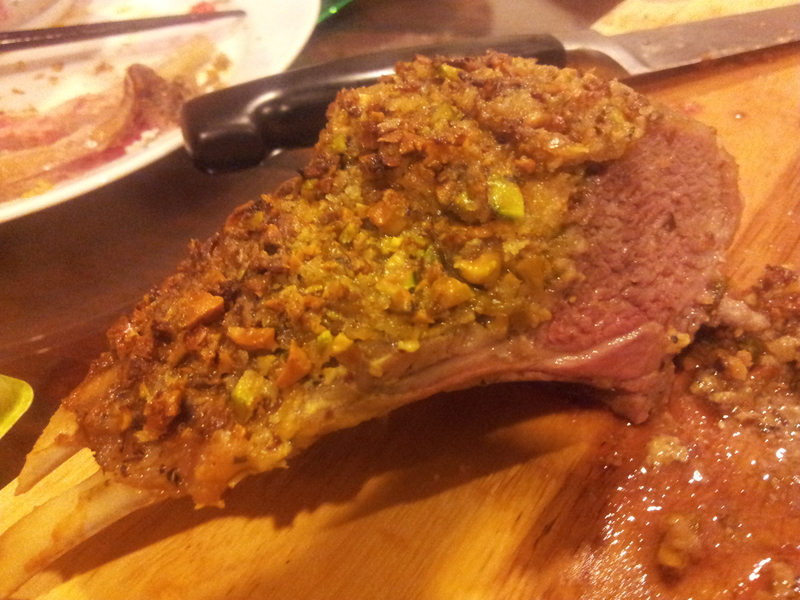 So I seasoned & browned the lamb rack, prepared the pistachio & the mix (add breadcrumbs, olive oil, melted butter) for the crust, rubbed dijon mustard on the lamb rack so that the pistachio crust sticked, and when my friends were here, while we were devouring the other dishes, I just put the lamb rack into a 210degC oven for 23minutes; and voila, I had a very impressive-looking & tasty pistachio crusted lamb which everyone really enjoyed! actually it was medium & I would have preferred medium rare, will try 21-22minutes next time. Looks like I won’t be eating lamb anytime soon when dining out. 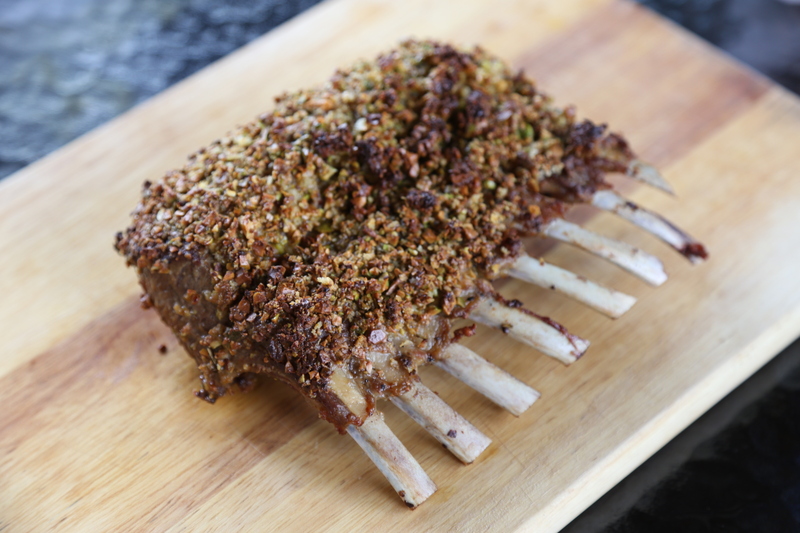 Prepare the lamb rack – cut/trim away the fat (to reduce the strong gamey taste/smell), cut about 2cm every 2 ribs w/o cutting into the loin (this for easy serving of the lamb rack afterwards), season with sea salt & coarse black pepper & pan seared including the ends over a very hot pan. put aside on an aluminium lined baking tray & reserve. Prepare the pistachio crust mix – cut about 1 cup of toasted pistachios into small bits. in a large bowl add 2 tablespoons breadcrumbs, 1 tablespoon olive oil & 1 tablespoon melted butter, & mix.